The Campaign for Responsible Use Ireland (CRRU Ireland) and IASIS have developed a one-day course for professional pest management technicians that have completed their basic training. 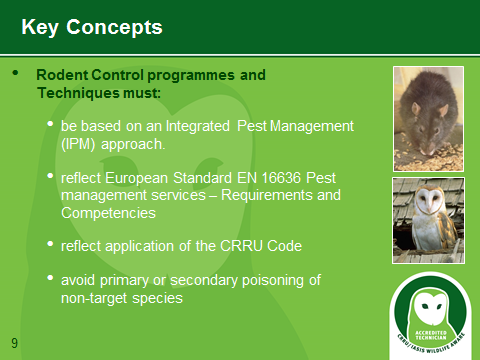 The emphasis on an Integrated Pest Management approach to rodent pest control and implementation of the CRRU Code, facilitates the effective and responsible use of rodenticide, ensuring that exposure of birds of prey and other top predators is minimised. Click to Book one of these courses now. Keeping premises rodent free is a continuing requirement for all food producers and manufacturers, for pharmaceutical and IT factories, for offices and warehouses - indeed anywhere a completely rodent free environment is required. Rats and mice are among the most prolific of mammalian breeders so vigilance must be on-going. Effective rodent pest management frequently requires use of second generation anti-coagulant rodenticides to keep areas free from rodents that spread disease, contaminate food and feed and damage property. Anticoagulant rodenticides are toxic chemicals that persist in wildlife food chains – moving into species of wild birds and mammals that feed on rodents. 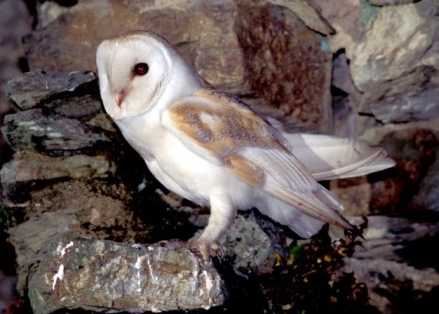 Barn owls have been particularly affected with over 80% of them having rodenticides in their bodies. Kites and Kestrels are also known to be affected. The Campaign for Responsible Use Ireland (CRRU Ireland) and IASIS have developed a one-day course for professional pest management technicians that have completed their basic training. The emphasis is on an Integrated Pest Management approach to rodent pest control with implementation of the CRRU Code thereby facilitating the effective and responsible use of rodenticide, while ensuring that exposure of birds of prey and other top predators is minimised. CRRU-IASIS Wildlife Aware Courses and accreditation are now available to professional rodent pest control technicians. These courses will also be of interest to Local Authority pest control operatives, Quality Assurance Managers, as well as Quality Assurance Auditors and Inspectors. IASIS accreditation provides evidence that the technician operates to the highest practical standards to achieve effective rodent control with minimum adverse effects on wildlife and the wider environment. Under the terms of current legislation, it is s an offence to use rodenticides other than in accordance with label instructions (EU 528/2012, EU 334/2014, S.I. 427 of 2013). Regular inspections are conducted by the Regulatory Authority to ensure compliance. Rodent control programmes that reflect an integrated pest management approach and that comply with the CRRU Code avoid risk of infringing current legislation on use of rodenticides. ‘Wildlife Aware’ accredited technicians are licensed to use the ‘Wildlife Aware’ logo in their businesses as a symbol of their special competence. The logo serves to inform customers and potential customers that the individual rodent pest control technician has been trained to avoid impact on wildlife while using rodenticides responsibly and effectively. A listing of ‘Wildlife Aware’ accredited rodent pest management technicians is provided here. Click to Book one of these courses now. Subject to the availability of a place on the particular course selected, registration will be completed once the registration fee has been paid. Persons that complete a CRRU-IASIS ‘Wildlife Aware’ course and are successful in the examination taken immediately following the course presentations are sent a letter inviting them to make application using an enclosed form to be returned to IASIS together with a signed licence agreement. 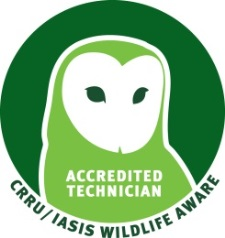 Accredited individuals are entitled to use the ‘Wildlife Aware’ logo as a visual representation of their competence and have their names and organisations listed in an on-line register maintained by IASIS. Click to view the list now. IASIS is a QQI (Quality and Qualification of Ireland) and Lantra registered service provider. We provide accredited training in both the plant protection, animal health and pest control business areas, up to QQI Level 6, for ‘distributors’ of plant protection, animal health products and pest control products.